Complete your look with perfectly shaped eyebrows. 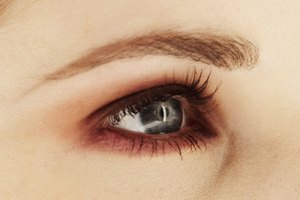 Your eyebrows aren't the most glamorous part of your face, but they may be the most important -- if you want to look put-together, it pays to show them a little love. Your brows frame your eyes, making them hard not to notice. If you're struggling with unruly, out-of-shape brows, sharpen them up with a bit of plucking. When you pluck, you'll remove renegade hairs and give your brows a neat, defined arch. Brush your brows straight up with an old toothbrush. Use small scissors to trim the ends of hairs that stick out where you don't want them. Brush your brows back into place. Again, trim the ends of any hairs you see sticking out. Hold a pencil vertically against the outer edge of the right side of your nose, and then look at your right eyebrow. You'll need to pluck any hair that extends past the left side of the pencil. To help you remember, mark the hairs you want to pluck with a brow pencil. Move the pencil to the left side of your nose and repeat with your left brow, marking any hairs extending past the right side of the pencil. Look at your face straight on in the mirror. Locate the highest point of your eyebrows. This is the peak of your brow's arch. Tweezing directly below it will give your brows a sharper look. 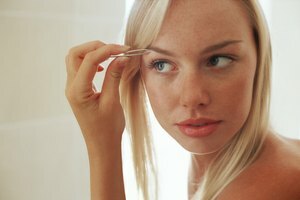 Use slanted tweezers to grasp an unwanted hair at its base, and pull the hair out using one quick motion. Holding the hair at the base will make it less painful to pull out. Repeat this for all the hairs you marked with the brow pencil. Pluck the row of hairs just below your brow's arch. This gives your brows a defined look. If you have very thick brows and you want a more pronounced arch, pluck another row of hairs just below the first one. Brush brows with a clear brow-gel wand. Smooth hairs up at the arch, and then brush the rest of the hairs toward the end of each eye. Smooth a post-tweeze cream or lotion over your brows to soothe any irritation. If you overpluck, fill in patchy spots with an eye pencil color that matches the shade of your brows. 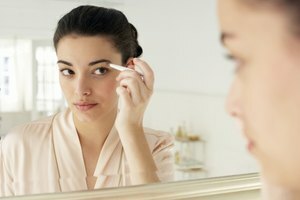 It's easier to pluck your brows after a warm shower. The warmth opens your follicles, so hair comes out more smoothly. Smooth a teething-pain ointment over brows if you find tweezing too painful. It'll numb your skin during and after plucking. King, Melissa. "How to Sharpen Eyebrows." Synonym, https://classroom.synonym.com/sharpen-eyebrows-15416.html. Accessed 26 April 2019.